Carl Larson at the 2014 Multnomah County Bike Fair. This is a guest post from Carl Larson, a Portland bike advocate and all-around bicycle culture Renaissance man. 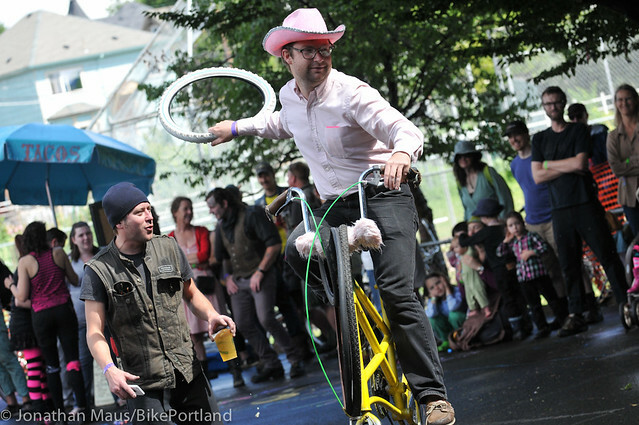 Amid many other bike-related activities including bike polo, World Naked Bike Ride, Mini Bike Winter, Zoobomb and Pedalpalooza, he’s worked for the Bicycle Transportation Alliance since 2008, currently as its engagement manager. 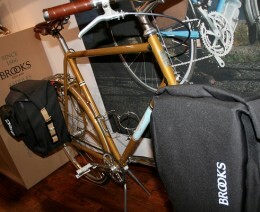 The BTA is eliminating the job on Jan. 31.
new panniers in a booth at Interbike. While it might not seem like activism to some, the 100-strong mass of people on last night’s BikeHugger.com Mobile Social left a big impression on the Las Vegas Strip in more ways than one. 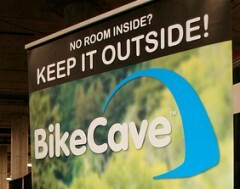 Downstairs at Interbike (the annual bike industry trade show happening right now in Las Vegas) is no-man’s land. If you want to see Specialized’s new bikes, meet with an Italian clothing maker, get a poster signed by a famous racer, or check in with major manufacturers and distributors, upstairs is the place to be. 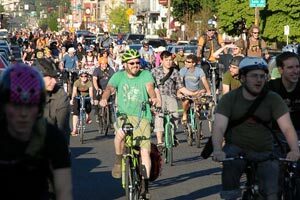 It’s officially time to start getting excited about Pedalpalooza — Shift’s 2+ week festival of bike fun that hits the streets of Portland in June. This article is by contributor Carl Larson. Carl previously wrote about the Zoobomb art rack project. This article was written by Carl Larson. A nearly ubiquitous presence on the Portland bike scene, Carl’s done everything from delivering bike maps as an employee of the City of Portland’s Transportation Options division, to working with the Regional Arts and Culture Council on the Zoobomb Pyle art rack project. Few people move between Portland’s many bike clubs, organizations and sub-cultures with as much panache and dedication as Carl. In this article, he shares a heart-warming story of tragedy and triumph within the Zoobomb community. will get a new home. Thanks to pressure from Commissioner Sam Adams‘ office, the Regional Arts and Culture Council (RACC) has given the project a budget of $10,000 (that’s less than 20% of the budget for “Pod,” the enormous metal shuttlecock-on-a-tripod that usually ends up in the background of tourists’ pictures of the beloved Pyle). 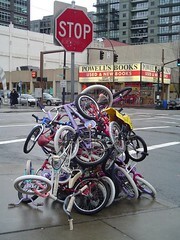 The RACC — in concert with PDOT and Zoobomb — plans to build a purpose-built structure at W Burnside and SW Stark to which the bicycles can be locked without the threat of citations or removal by the city.